Shanghai Hangfu Airdrome Equipment Co., Ltd. is known as a high-tech enterprises is a joint-stock company which is specialized in the design, development, production, installation of the aviation transportation equipments as well as providing maintenance and accessory service. The main products are such as towing tractor, baggage towing tractor, electric tractor,conveyor belt loader, waste water truck, water truck,container &Pallet Transporter, passenger steps,catering truck, rubbish truck, disabled passenger, shovel elevation platform, joint platform, pallet dolly, container dolly, bulk cargo dolly, pallet, shelf and so on. We have 48,000 square meters now, in which plant area is 30,000 square meters. We have more than 100 units professional equipments and our company have a complete sets of equipment and assembly lines in our production,and we strictly follow ISO9001:2008 to guarantee the quality. 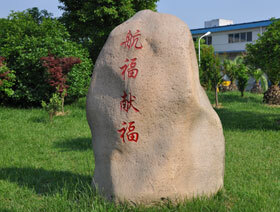 Shanghai Hangfu was found in 1995 and established the airport special vehicle development center in 2005. With perfect product development, technical management and production management system.Shanghai Hangfu provide with new technology and high quality products and the long-term credit and support from the customers be cause of reasonable price and excellent service.Now HangFu has become one of the most important and first capable supplier.Our company is located in Da Mai Wan Industry Zone,Pudong Shanghai.It is 18 kms between our company and Pudong International Airport, 30kms to Hongqiao International Airport, and only 25 kms from Yangshan Deepwater Harbor. our President and CEO Mr. Zhang Qing Jun and all staff provide the lastest technology supper best quality products and contribute to aviation GSE. Our Promise: To create HangFu First capable in aviation GSE and statisfy our customers forever!